The Viking Queen Raids Kickstarter! Publishing company Source Point Press has unveiled the latest from famed comic book writer Paul Storrie (Gotham Girls, Robyn of Sherwood, Batman Beyond, Captain America, Justice League Unlimited) on Kickstarter recently. 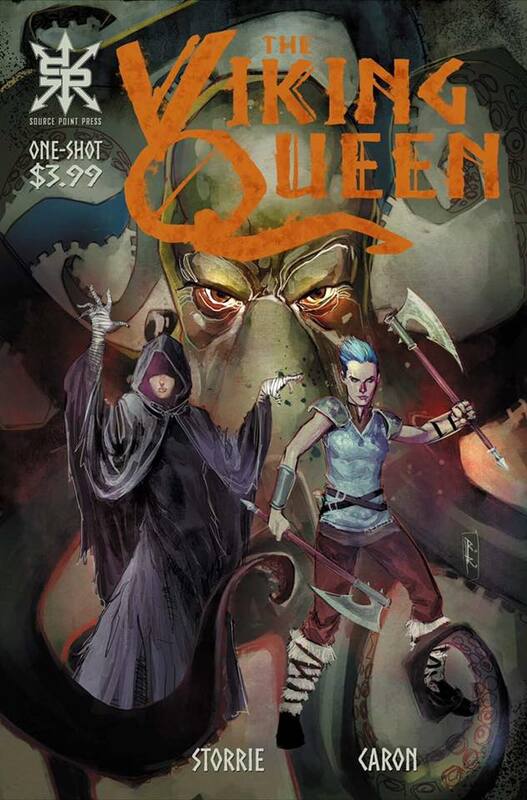 Storrie has written a one-shot comic book titled The Viking Queen that began a two-week Kickstarter campaign on January 15th. Editor-In-Chief Travis McIntire commented “Paul’s been a great friend to Source Point Press, and we’ve been wanting to work together for some time now. The concept for this story was originally one that was intended for a fantasy anthology that didn’t pan out, but was so excellent we wanted to expand upon it to make it its own one-shot title.” The comic has already made 400% of its goal on Kickstarter in just a couple days, and unlocked three stretch goal bonus rewards for backers as low as $10. Artist Kevin Caron (artist on IDW’s Badger Bull, and Badger Saves the World) took on duties of pencils and inks on The Viking Queen. “Kevin and I had both worked on Sheena: Queen of the Jungle series, and he’d reached out at the perfect time to see if there was anything else we could collaborate on,” says writer Paul Storrie. Sean Seal, a fan-favorite artist on many Source Point Press titles such as Norah, The Rot, and Michigan Comics Collective’s Wild Bullets, is doing the colors for The Viking Queen. The cover art was done by acclaimed artist Rod Reis, who you may know from titles such as Teen Titans, Superman, Justice League, Nightwing, C.O.W.L., Suicide Squad, Mortal Kombat X, and his latest Image series Hadrian’s Wall. Source Point Press is a Michigan-based publisher, rapidly becoming a leader in publishing alternative fiction in the form of books, graphic novels, and comics. With a large focus on horror and science fiction, Source Point continues to produce quality content with both legends in the industry as well as new artists and writers on the rise. More information can be found at www.SourcePointPress.com, twitter.com/SourcePtPress and facebook.com/SourcePointPress. Email josh@sourcepointpress.com for inquiries or interview opportunities with the creators. Newer PostHelp us get Source Point Press Comics in YOUR Local Store! ©2016 Source Point Press. All rights reserved.